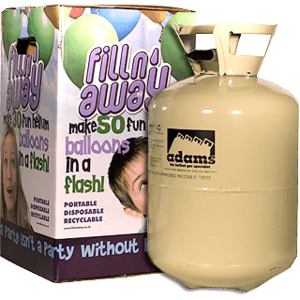 This package is a flexible and convenient way to inflate a large number of latex or foil balloons with helium. The Disposable Cylinder 200 will inflate up to 200 9" latex balloons, 160 10" latex balloons or around 100 18" foil balloons, so perfect for medium sized celebrations or promotional events. The package includes four helium cylinders, each one just 4.5kg, so a lightweight and flexible option if using at multiple venues. Your cylinders are delivered by courier and once you've used all the helium, you can take it to your local household recycling centre. Click here to compare all our disposable cylinders.